Titles added to Incoming, or augmented with additional information, this week include the Raging Bull Blu-ray; the second series of Fall Guy; Richard Gere thriller The Hunting Party; Oscar-nominated drama The Visitor; the third season of Waterloo Road; animated horror anthology Fears of the Dark; Korean thriller The Chaser; John Huston's cult favourite Wise Blood; action thriller Transsiberian; star-studded comedy Married Life; and BBC drama Consuming Passion - 100 Years of Mills and Boon. Click on the sleeve images for track-listings and more information. Specialist label Film Score Monthly doesn't generally re-visit the scores it's released on CD. When one of their limited edition discs sells out, it's gone for good. The exception to this rule is their new re-released version of Ron Grainer's score for the 1971 Charlton Heston post-apocalypse vampire movie The Omega Man (based on the same book as the Will Smith movie I Am Legend). The original release of The Omega Man score - a godsend to its cult following - is one of the few FSM discs to go out of print, despite it's relatively healthy pressing of three thousand copies. 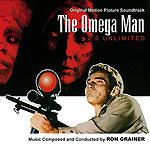 Sensing that this title has wider appeal than the well-defined coterie of soundtrack collectors, the label has decided to go back to the licensees, and, at considerable expense, make a deal to make The Omega Man CD more widely available. It's been eight years since The Omega Man was originally issued, and the label has wisely decided to re-master the recording from scratch. In doing so, they've corrected a shortcoming of the original version, adding missing organ overdubs to three cues (the isolated organ recordings had been archived separately from the main master tapes). They've also dropped the comprehensive liner notes (which will continue to be available at FSM's website), and removed a bonus track (an extract from the session recordings, with comments from the composer), no doubt in recognition that this new edition will be sold to people who wouldn't consider themselves soundtrack collectors. The disc has been handsomely re-packaged as The Omega Man 2.0 Unlimited. Given the improved sound, and snazzy new packaging, I doubt that there will be many fans who won't think it well worthwhile upgrading to the new version. Label boss Lukas Kendall explains his decision to re-release The Omega Man here. For me, no composer characterises FSM's Golden Age Classics range of discs than King Kong's Max Steiner. Unarguably one of the greatest talents to work in the field, it's something of a surprise to discover that the disc featuring music from 1959's John Paul Jones and 1961's Parrish is the first proper Steiner disc released by the label. 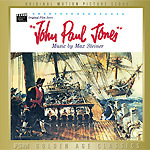 The thirty-seven minutes of music from John Paul Jones is the album re-recording of the score, recorded in stereo by the Sinfonia of London, under the baton of Muir Mathieson (the film sessions are lost). It's rousing stuff. The score seems to define the clichés associated with the genre. Liberally incorporating nods to patriotic standard Yankee Doodle and Alexei Lvov's anthem God Save The Tsar!, the score also has it's more romantic and lyrical moments, for cues like Catherine The Great. Parrish is a completely different type of film, with a very different Steiner score. A drama set on a tobacco plantation, the film was the follow-up to the incredibly successful teen romance A Summer Place. The two films shared the same star, Troy Donahue, composer and director, and marked the return of Claudette Colbert to the screen after a brief retirement, in what would be her last movie. The CD presentation recreates the original album re-recording of the score. The first half offers seven often very beautiful tracks, including John Battacuda's sombre Tobacco Theme, and jaunty themes for five of the film's key characters. The disc also contains - as did the original LP - "Popular Piano Concertos of the Great Love Themes From The Warner Bros. Motion Picture Parrish", featuring three of Steiner's themes from Parrish, as well as Tara's Theme from Gone With the Wind, and, inevitably, a version of the incredibly popular Theme From A Summer Place (a track that beat out Sinatra, Presley, Fitzgerald and Ray Charles for the 1960 Grammy for Record of the Year). The Parrish tracks are in mono, from the original half-inch master tape. Steiner's score for Rome Adventure has been paired with Bronislau Kaper's elegant Auntie Mame for another recently-released FSM Golden Age Classics disc. Auntie Mame, Warner Bros' smash-hit adaptation of the legendary Broadway comedy, features a bouncy score that perfectly captures the movie's oddball titular character (played by the irrepressible Rosalind Russell). The new FSM disc marks the score's first appearance on CD, albeit the album re-recording, conducted by Ray Heindorf, which is in stereo. 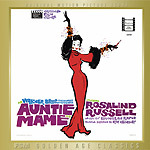 The disc replicates the original album, which also features a re-recorded version of the Auntie Mame theme, plus instrumental versions of Kaper songs from On Green Dolphin Street, Invitation, The Glass Slipper and the Oscar-winning Lili (the latter three are available on FSM discs of their own). Rome Adventure, another love story from the Troy Donahue / Delmer Daves team, gave Suzanne Pleshette (who sadly died earlier this month) her first significant film role. Steiner's highly melodic score, featuring mandolin and accordion, to give it a suitably Italian flavour, is arguably overshadowed by Betty Curtis' song Al-di-La, performed by Emilio Pericoli. The song was an enormous hit later covered by artists including Dean Martin, Connie Francis and The Eagles. About twenty minutes of Steiner's music from the film is featured (once again, from the stereo album re-recordings), followed by "Other Neapolitan Favorites", similar cues from other composers, which had been featured in other Warner Bros. films. Not really my cup of tea, this one, but I'm sure it will be warmly welcomed by those with an affinity for this type of thing! Maurice Jarre's score for John Frankenheimer's recently-revitalised 1966 action movie Grand Prix hits the ground running. Its Overture is one of the busiest cues I've ever heard, and its stereo mix is a treat for the ears, as Jarre attempts to mimic the Doppler effect of cars passing the listener at speed. Subsequent tracks are considerably calmer, demonstrating Jarre's gift for melody. 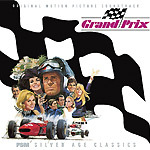 The score features three key themes, in various arrangements and combinations: the Main Title theme, one for English racer Scott Stoddard (Brian Bedford), and one for Frenchman Jean-Pierre Sarti (Yves Montand). The film was produced under some pressure, perhaps a factor in Frankenheimer and Jarre's decision to score the film sparsely, focussing on the relationships between the characters, rather than on the film's impressive racing scenes (the film won Oscars for its sound mix and effects). There are less than fifty minutes of music in the film's three-hour running time. FSM's disc features the complete score, as well as twenty-odd minutes of Jarre-penned alternate tracks and album versions (including Bossa Nova versions of Scott and Jean-Pierre's themes, and an "easy listening" version of Lara's Theme, from Doctor Zhivago, recorded - but not used - as potential source music). Sound effects, which blighted the original LP presentation, have been eliminated from this new CD. Jarre's music is also featured on a special Film Score Monthly release, Concert Works, which, as the title suggests, is not film music, but material composed for the concert hall, dating from the decade before Jarre made his mark in Hollywood (with two epic 1962 movies: The Longest Day and Lawrence of Arabia). The disc offers five concert pieces, plucked from the vaults of French national radio archive the Instiut Nationmal de l'Audiovisuel. 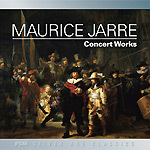 Jarre's composition's are certainly interesting: highlights include Three Dances for Ondes Martenot and Percussion, which showcases the instrument that would feature extensively in the score for Lawrence of Arabia; and The Night Watch, written for a television documentary about Rembrandt's famous painting of the same name (thoughtfully featured on the cover of the booklet). Limited to 1500 copies, and with less-than-ideal sound quality, due to the archival nature of the recordings, it's perhaps fair to say that this title will have limited appeal outside Jarre fans. It will probably turn out to be a valuable collector's item, once it goes out of print! 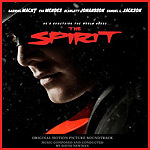 Silva Screen will release the soundtrack to Frank Miller's movie The Spirit on February the 2nd. The soundtrack, by David Newman, has been available as an on-demand CD-R for a while, but the (UK) Silva Screen disc offers the only chance to get it on a legit pressed CD. David Newman often labours on projects that don't really give his music the exposure it deserves. Most of the films he scores - mostly high concept comedies - result in CDs populated with pop songs (often of the "Music From And Inspired By" variety), so it's a bit of a treat to have one of his scores given a chance to shine on its own. Of course, Newman is no stranger to the genre, having scored the underrated 1996 superhero movie The Phantom. The Spirit kicks off with a cue that recalls the building rhythms of Birth of a Penguin II from Elfman's Batman Returns, accented with the plaintive harmonica of The Untouchables' The Strength of the Righteous (the instrument, played by soundtrack veteran Tommy Morgan, comes to symbolise the movie's eponymous hero). The score's idiosyncratic textures, blending noir with smoky jazz, carry into the rest of the album, create a score which is full of fun, inventive moments and ear-catching orchestration. The film may have been savaged by the critics, and forsaken by audiences, but its score deserves to be heard. Highlights include the shimmering culmination to the romantic strand of the film, Spirit Kisses Sand. The CD includes a fold-out poster, featuring exclusive Frank Miller artwork. A couple months ago I caught up with a Clerks-like British film from 2006 about supermarket workers called Cashback, which features the lovely Emilia Fox. Investigating whether the film had spawned a soundtrack CD, I found that one was planned for release in December last year - a couple of months after even the DVD had come out - but no-one seemed to have it in stock, so I assumed it had been cancelled. Well, the CD wasn't cancelled, just delayed, and it's being released by Silva Screen on February the 16th. I wouldn't claim that Guy Farley's dreamy score (reminiscent, in parts, of the more wistful moments of Kamen's Highlander) is especially exciting, or even that memorable, but the disc is a nice collection for fans of the movie. In addition to twenty minutes of score (performed by the London Metropolitan Orchestra), there are nine additional tracks, including a schmaltzy track by Trevor Duncan called Enchanted April.